Clive Staples Lewis (29 November 1898 – 22 November 1963) was a British novelist, poet, academic, medievalist, literary critic, essayist, lay theologian, broadcaster, lecturer, and Christian apologist. He held academic positions at both Oxford University (Magdalen College), 1925–54, and Cambridge University (Magdalene College), 1954–63. He is best known for his fictional work, especially The Screwtape Letters, The Chronicles of Narnia, and The Space Trilogy, and for his non-fiction Christian apologetics, such as Mere Christianity, Miracles, and The Problem of Pain. Lewis and fellow novelist J. R. R. Tolkien were close friends. They both served on the English faculty at Oxford University, and were active in the informal Oxford literary group known as the Inklings. According to Lewis's memoir Surprised by Joy, he was baptised in the Church of Ireland, but fell away from his faith during adolescence. Lewis returned to the Anglican Communion at the age of 32, owing to the influence of Tolkien and other friends, and he became an "ordinary layman of the Church of England". His faith profoundly affected his work, and his wartime radio broadcasts on the subject of Christianity brought him wide acclaim. In 1956, he married American writer Joy Davidman; she died of cancer four years later at the age of 45. Lewis died on 22 November 1963 from renal failure, one week before his 65th birthday. 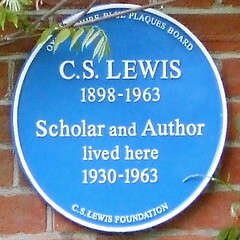 In 2013, on the 50th anniversary of his death, Lewis was honoured with a memorial in Poets' Corner in Westminster Abbey. Lewis's works have been translated into more than 30 languages and have sold millions of copies. The books that make up The Chronicles of Narnia have sold the most and have been popularised on stage, TV, radio, and cinema. His works entered the public domain in 2014 in countries where copyright expires 50 years after the death of the creator, such as Canada. C. S. Lewis (1898-1963) From this favourite vantage point C.S. Lewis, saint and scholar from the County Devon, enjoyed a view of the countryside and Belfast Lough after walking tours locally with his lifelong friend Arthur Greeves. Devoted to his native County and Oxford University, C.S. Lewis loved both places. His description of perfection recorded in 'C.S. Lewis - at Home in Ireland' says it all. 'Heaven is Oxford lifted and placed in the middle of the County Down.' During 1998 North Down Heritage Centre made an important contribution to the C. S. Lewis Centenary Celebration.